The list of improvements on the EB48.2 starts with our XT suspension arms (TKR5030XT, TKR5036XT) as standard equipment which improves durability tremendously. We have included the +1.5 degree rear toe plate (TKR5013B) along with a new 0.5 degree offset insert to go along with the 1.0 and 0.0 offset inserts (TKR5021). New shock cartridges and shock bushings (TKR6008) improve handling consistency and reduce shaft deflection. The differentials have been overhauled with new cross-pins and internal gears (TKR5149, TKR5150, as featured on the SCT410) as well as new straight cut CNC diff ring and pinion gears (TKR5151, TKR5152). The new gears are quieter, smoother and more efficient than previous gears and feature lightweight cutouts to reduce rotating mass. Lightened differential outdrives (TKR5112X, TKR5114X) are used throughout. The lightened aluminum center driveshaft (TKR5077) is now standard as well. A lighter drivetrain results in faster acceleration, higher top speed, and reduced wear. Our new angled rear gearbox (TKR5016B) and larger bearings (TKRBB05134) round out the driveline improvements. The new gearbox reduces wear and increases efficiency by minimizing the drive angles. Up front the EB48.2 features a new HD servo saver spring (TKR5101X) which helps to keep you pointing in the right direction. Lightened steering posts (TKR5102A) as well as lightened suspension sleeves (TKR5054A, TKR5055A) help reduce weight without any sacrifice in durability. Aluminum hard anodized pivot balls are used throughout (TKR5049A, TKR5052A, TKR5053A, TKR5058A, TKR5079A) to reduce weight. A more durable servo horn has also been included. Combine all of this with an improved out-of-the-box setup and you have the best 1/8th Electric Buggy on the market. The EB48.2 raises the bar once again! 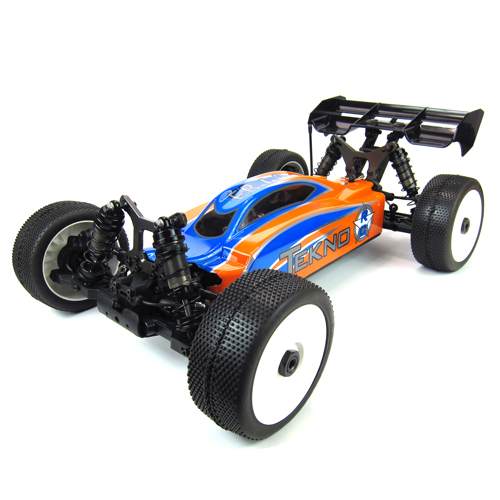 Super narrow chassis – widest point is only 125mm (less than 5”) mudguard-to-mudguard. 5mm CNC 7075 aluminum shock towers are standard. Innovative cone piston design (not just tapered) provides varied compression and rebound rates. Optional spring rates and spring kits are available. Adjustable length rear arms to suit any track condition. Front and rear arms can be used on either side, rear hubs can be used on either side – less parts in your toolbox. ‘Narrow pivot’ steering posts provide ‘0 bump’ geometry with almost ’0 steering slop’. 2-piece CNC aluminum motor mount with precise dual clamping gear mesh adjustment. Use standard MOD 1 pinion, Tekno RC Traktion Drive or Elektri-Clutch. Use motor brakes or mechanical brakes, the choice is yours. Easily accommodates ‘Truggy’ or ‘Long’ can motors up to 78mm long. Lightweight easily adjustable wing mount system. Easily adjust anti-squat, rear toe, front arm angle, front arm sweep, roll center, toe, camber, wheelbase, rear arm length, Ackerman, bump steer, suspension geometry out of the box..